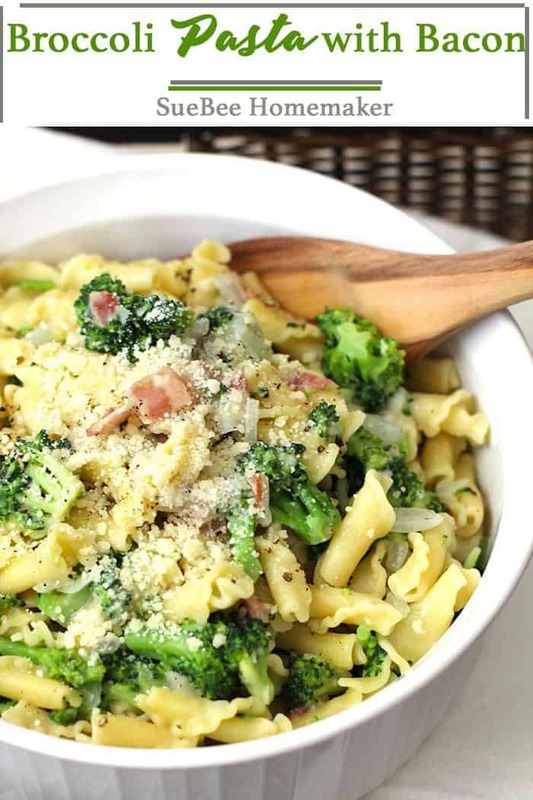 Broccoli Pasta with Bacon is an easy, one-pot pasta, with Campanelle noodles, broccoli, bacon, and parmesan cheese! This one makes a great week-night meal. I change it up almost every time I make it. But I REALLY prefer the broccoli because it cooks fast in only a few minutes (along with the pasta). And it tastes great every single time. I’ve tried to use other veggies but it’s never as good as using broccoli. 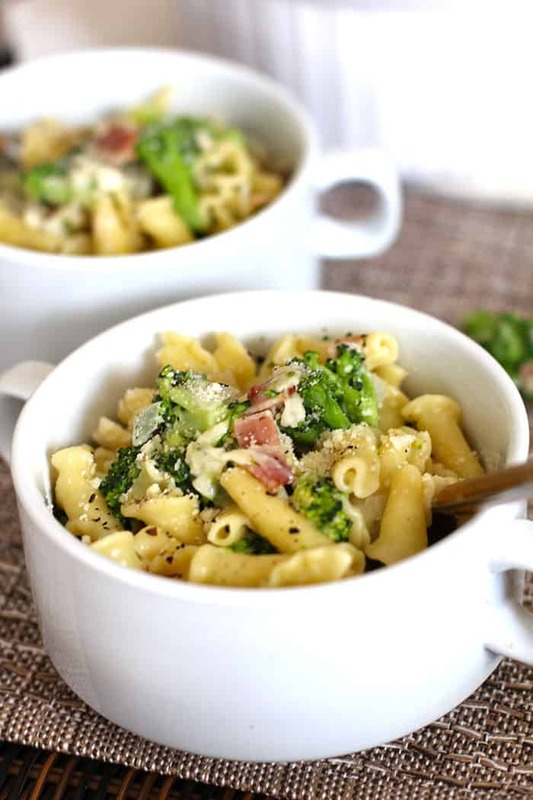 One of the most important steps in making Broccoli Pasta with Bacon is to SAVE SOME PASTA WATER. Don’t forget. I always put a bowl under the strainer right away because it’s so easy to just dump the water down the drain. The pasta water is what makes everything stick together since there isn’t a lot of oil or butter in this recipe. Don’t forget —> keep some pasta water! Using pre-cooked bacon is also a huge short-cut when trying to get dinner on the table in a hurry. Just dice it up and throw it in the pot, cooking it for a few minutes to get a crunch. It goes great with the parmesan in this dish. If you want to make this a meatless meal, just simply skip the bacon. 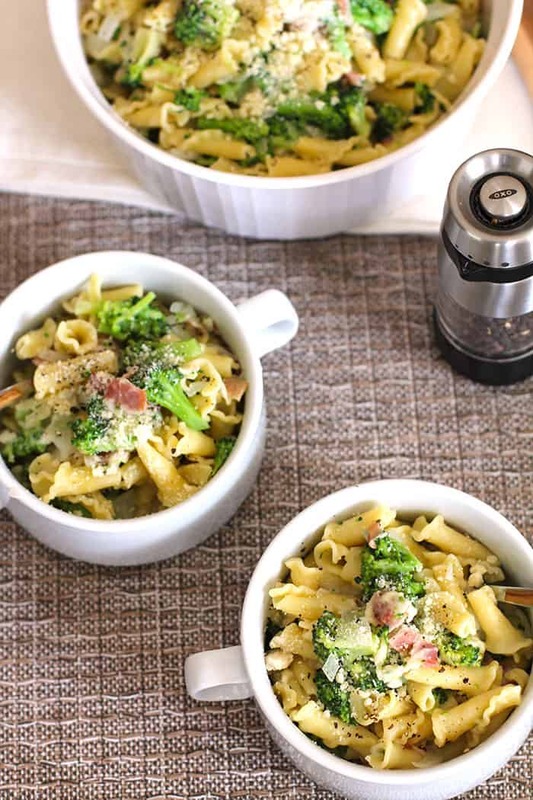 An easy, one-pot pasta, with Campanelle noodles, broccoli, bacon, and parmesan cheese! Fill a large pot (about 2/3 full) with water, and bring to a boil. Add pasta and salt generously. Let boil for approximately 3-4 minutes, and then add broccoli to pot and stir again. 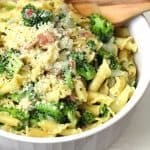 Let pasta and broccoli simmer until pasta is el dente, soft but firm to the bite. Place a medium bowl in the sink with a strainer on top. Drain the pasta and broccoli mixture, while catching a couple of cups of the pasta water in the bowl. Return the empty pot to the burner. Add olive oil, bacon, and garlic - saute for one minute. 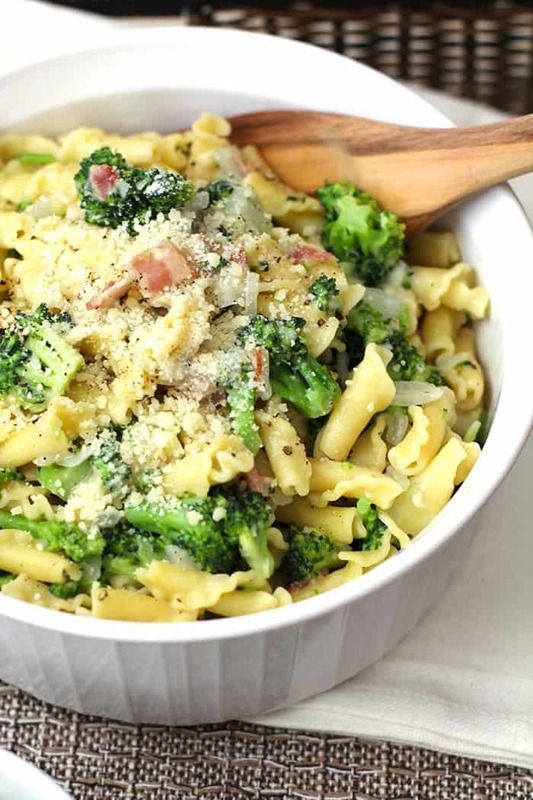 Add pasta and broccoli back to the pan, along with the butter and parmesan cheese. Stir and gradually add some of the pasta water (approximately one cup or enough to get everything nicely combined and smooth), to add moisture to the ingredients. Stir and serve with extra parmesan and freshly ground black pepper. This is a lighter recipe. If desired, add a roux by adding flour to the sautéed onion, along with chicken broth and milk. Refer to my spaghetti squash and cheese recipe for the directions for a roux. Love the simplicity of this 9 ingredient recipe! The 🥓 really makes this recipe pop!